There is a man I so much love and respect I discovered something great about this man, he never achieved his success overnight, he never gave up he had the hope that his dreams will come pass, if you are a big fan of Madea then you will know this man it is no other person but the Madea character himself “TYLER PERRY”. Born into poverty in New Orleans, Louisiana on 13th September 1969 as Emmit Perry Jnr, as a child he suffered abuse from his father like he once said that his father’s answer to anything was to beat it out of you and he even attempted suicide once just to escape his father’s beatings, the only place he found refuge was in church which his mother took him once a week and in an effort to distance himself from his father at the age of sixteen he changed his name from Emmit to Tyler Perry, he never completed his high school degree but he earned a General education development which is known as GED (a diploma for adults which is equivalent to a high- school diploma). A simple advice from Oprah Winfrey set his career into motion, encouraged to keep a diary of his thoughts and experiences, he began writing a series of soul-searching letters to himself, the letters were full of pain and in time forgiveness became a healing of emotional release, his writings later inspired a musical called I know I’ve been Changed. In 1992, he gathered his life savings of about $12,000 in hopes of staging a play he spent all his money but people never came and Tyler once again came face to face with poverty that had plagued his youth, he spent months sleeping in seedy motels and in his car but his faith in his God and in himself only got stronger, he kept writing and in 1998 his perseverance paid off , a promoter booked I know I’ve been changed for a limited run at a local church-turned-theatre and this time people came out in droves and Tyler never looked back. 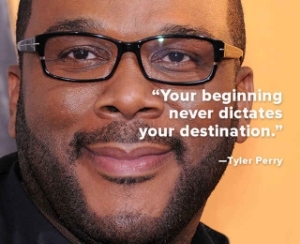 Tyler Perry has earned US $130 million between May 2010 and 2011, in 2011 Forbes named him the highest paid man in entertainment and today he is a nothing but a success story. He is a man who had hope and never gave up. Samuel Smiles said “Hope is like the sun, which as we journey toward it, casts the shadow of our burden behind us” Hope is that stubborn thing in us that insists in spite the challenges it believes that something better awaits us; all we need is the courage to keeping believing, keep reaching, keep working hard and not giving up. 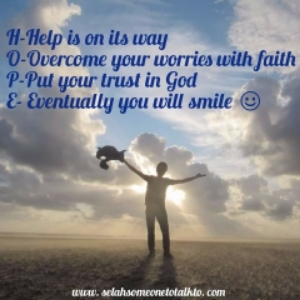 There are times when it looks as if the world is crashing and it seems like your good dreams will never come pass but I want you know all you need to do is to hold on to your faith, keep your hopes alive and don’t give up. I have good news for you it doesn’t matter where you are, your background, your past, who your parents are you can actually make it if only you keep working hard and you keep your faith alive there is always enough room at the top. I know it may be hard right now but I want you to know that God has not forgotten you. 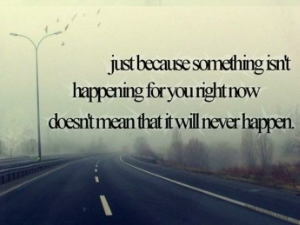 You are in God’s plan, so do not be discouraged. All you need to do, is to light that candle called “Hope” and keep it burning, for a brighter future awaits you. Morgan Freeman didn’t appear in a movie until age 34, and didn’t get a big role until he was 52, he kept doing what he knows how to do best, he didn’t lose hope in spite of his age and it paid of. He is now one of the highest paid artist. Anne Frank said “When there is hope, there is life. It fills us with fresh courage and makes us strong again” as long you are still breathing and you are still alive you can make it, don’t lose that hope of making it, sustain that hope! Of course, the road is not going to be easy, every great man has been there but what made them great was that they never gave up. You are born to be great, God never made you a failure, failure is just temporary, if you have failed get up and get going. Remember, you are not a failure, you are a success and the world is waiting for you because your story will inspire generations if you don’t give up, I challenge you today to sustain that hope and keep your dreams alive because you are born to be great! I believe in you! Keep working hard! The best you can be is number one!